How to Poach an Egg | Eat This! 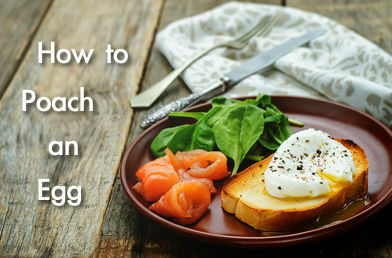 Many people are intimidated by the idea of making poached eggs, but it’s not as hard as it seems. Here’s how to poach an egg in eight easy steps. 2. The temperature of the water is important. You want to poach the egg before it starts to simmer. Watch for the small bubbles to appear on the bottom of the pan. At this point the water is very hot, but the bubbles haven’t begun to rise up through the water (you will see lots of small bubbles sitting at the bottom). If the water begins to boil, lower the temperature until it is just below boiling point. 3. Break the egg into a small dish, being careful not to break the yolk. You may try cracking the egg directly into the water, but it’s easier to drop it in from a small bowl. 4. With one hand, use a wooden spoon or spatula to create a whirlpool in the water, then drop the egg into the water with your other hand. It’s best to get it as close as possible to the middle of the whirlpool. 5. The whirlpool helps to hold the yolk together. Once the egg is in, stop swirling and begin to push the edges of the egg white in towards the yolk to keep it all together. 6. Don’t let the egg sit on the bottom of the pan, because it will stick. Once the egg has been in the water for at least 30 seconds you can carefully slide a spatula under the egg to keep it off the bottom. 7. Let the egg cook for a total of three to four minutes and then scoop it out of the water. A slotted spoon works best because it allows the water to drain. 8. Serve immediately or refrigerate and reheat later.